This film is made as part of the 48 Hour Film Project, 2006. Competitiors drew genres from a hat and received 3 required elements. Each film was written, shot, mixed and edited between June 23rd at 7pm and June 25th at 7pm. 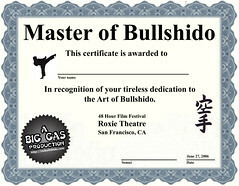 No Bullshido was a collaboration of more than 20 filmmakers with a wide range of skills. Line of Dialogue: "When are you going to clean up this mess?" 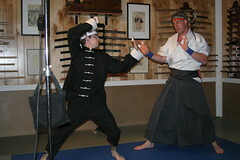 Photos from the production and screening are available in a No Bullshido set on Flickr. You can download our artwork and print your own certificate at home! DVD label and sleeve artwork will be available here soon.